Last summer I attended the wedding of an old roommate down in Memphis, Tennessee. The theme was “Summertime Fly.” It was one of those things where, even if you knew the couple, you were still kind of like… “Wait, what does that mean, exactly?” My girlfriends and I eventually agreed that printed cocktail dresses were perfect for the ladies in attendance—but I drew a blank when trying to imagine what the guys would wear. Turns out that most guys’ interpretation of Summertime Fly was…a navy suit and brown lace-up shoes. Classic? Sure. But “fly?” Not exactly. They blended together like the sea of businessmen I battle each morning in Midtown Manhattan. That is—all except one. A friend of the groom wore a beautiful washed teal linen suit, white shirt, and no tie. Full disclosure, I may or may not have had a crush on him years ago, but believe me when I say, he looked incredible. I told him as much, and, well, he was a little smug about it. But that’s not the point. The point, you guys, is that he embraced the unique wedding dress code, and here, a year later, I can still picture his head-to-toe look perfectly. Don’t you want to look this memorably stylish at all your summer weddings? I bet you do. By now, you’re familiar with wedding dress codes as a concept, but adhering to them? That can still be a challenge. I would even wager a guess that unless it’s black tie, you’re probably recycling the same couple suits over and over again. While that may be economical—it’s not very fun! I really hope this isn’t the first time you’re hearing this, but a casual dress code at a wedding does not mean you can wear jeans. Or—hoo boy—shorts. You cannot. But you can absolutely wear your favorite pair of nice chinos or lightweight dress pants. AND you can leave the blazer (and socks!) at home. This is a special occasion, remember, so even if you’re simply headed to your cousin’s backyard where your uncle’s flipping burgers for dinner, you still want to honor the bride and groom with a snappy look. A slim, great fitting polo is definitely an option, but since you come here for *opinions* not options, I’m going to strongly recommend a printed shirt. Like the short-sleeved Riviera or Bonobos’ unbutton-down shirt with the sleeves rolled up! You’ll look cool and fun, but not like you’re trying too hard. And again, just as a reminder, this is a wedding—so tuck your shirt in! Odds are you’ll be the best-dressed guest no matter what, but why not really drive the point home with your finishing touches: a woven leather belt and some suede espadrille smoking slippers. They’re the perfect (not to mention ridiculously comfortable) shoes for dancing the night away with your adorable nieces under strings of twinkly lights. A casual dress code doesn’t mean you don’t have to try. You should still want to look stylish, cool, and put-together. So iron you shirt, trim your beard and be the dopest goddamn version of “casual” you possibly can be. There’s something about seeing the words “cocktail attire” printed on gorgeous, expensive paper that makes me salivate slightly. Maybe it’s because I’m imagining that first crisp sip of a Negroni at sunset, or maybe I’m imagining all the handsome dudes on the dance floor in their favorite dark suit, wondering if one of them will dab my forehead with their pocket square later. From there, take a few liberties with colors and prints! Bonobos’ Daily Grind Wrinkle Free Dress Shirts come in some really nice, subtle prints like swiss dot and mini-gingham—which pair nicely with on-trend floral ties and your most whimsical pocket squares. You want the overall effect of your kit to be dressy, but not rigid. That’s why, as a finishing touch, you could swap out your go-to lace-up dress shoes for a really nice pair of leather tassel loafers! Slick, right? If mixing prints makes you nervous, remember that it’s all about balancing proportions and tying colors together. And hopefully it goes without saying, but none of the prints should be the same. In the lewk above, peep that tiny navy swiss dot print on the shirt with a lavender seersucker pocket square, and a floral tie with elements of navy, purple and white. Cocktail attire is like the Negroni itself: Sleek and sophisticated with a refreshing twist. Avoid the urge to dress like you do for the office and kick your favorite suit up a notch with playful, fashion-forward details. Formal always means a suit, even at the beach. (Sorry Bermuda shorts, you’re not welcome at this party.) So, opt for one that’s really lightweight and airy, and if you’re itching to branch out from your tried-and-true navy, I encourage you to explore the summery range of beige, light grey, sky blue, pale pink or even off-white. It could even be mint green if that’s what you’re into! A simple, ultra-crisp white shirt in linen or cotton will keep you in the “safe zone” of looking formal, but if, for example, this beach happens to be in the Virgin Islands and not Martha’s Vineyard, feel free to get a bit creative with a punchy print. Only nerds wear socks to beach weddings, so embrace this opportunity to rock a pair of suede loafers or woven slippers with some exposed ankle. A light sandy suede or natural leather will go nicely with any of the above suit colors. For accessories, keep your location in mind. A caribbean or Hawaiian destination wedding is your moment for tropical florals and palm prints on your tie or pocket square. For a coastal wedding in Washington or Maine, on the other hand, think stripes and gingham and tiny, subtle florals. Again, I know it’s “the beach,” but, reflective lens sunglasses ring a bit “over” to me in the Year of Our Lord 2018. Instead, try a colored, semi-transparent lens in blue or green as a fun alternative to your typical dark grey or black. Love your beach wedding look the way you love the beach. Embrace the breeze. Embrace the tropical vibes. And don’t make a big to-do out of getting sand in your loafers, nerd! *A note: It’s up to you to judge based on the bride and groom’s vibe, but for beach weddings you can usually opt out of wearing a tie. Leave the top button of your shirt undone and accessorize with just a pocket square. Oh boy, right? “Festive” is such a fun dress code—but that doesn’t mean it’s not without its challenges. First of all, yes, it’s slightly vague. Second, it can be intimidating if you’re not a typically adventurous dresser. For the uninitiated, “festive” is basically the same as a “cocktail” dress code, but the hosts encourage a dash of whimsy. What does that mean? The bride and groom want you to get creative! Of course, you can approach your festive wedding guest look a few different ways. You can dress up a classic suit with a bold printed shirt and pocket square. You could wear a traditional wedding look with statement-making shoes in a fun color. Or, you can deconstruct a suit and try mismatched separates with a cool print and a pop of color or two. What? That sounds crazy and maybe kind of hard to pull off? Let me explain. First, I’ve singled out one of my favorite menswear pieces of all time—the ivory blazer. This sleek number is Bonobos’ Unconstructed Italian Wool Blazer, which is the more casual, comfortable version of a black tie dinner jacket. To avoid looking like a cater-waiter, I’d wear it with linen dress trousers in a tonal shade of khaki. Keep it funky with a totally unexpected shirt like this black-and-white leaf print button down. For finishing touches, you’ll have to judge by the venue and the time of the wedding how formal to go. A more relaxed setting and a 3 p.m. ceremony means you could probably go sans tie and wear a cool pair of leather sneakers (like these pink bad boys!). For a festive wedding after five, opt for your dressy loafers or lace-ups—but no matter what don’t forget your no-show socks. It’s summer, after all! Ankles out! To me (and most women, let’s be honest), there are few things more attractive than a man done up in full black tie regalia. 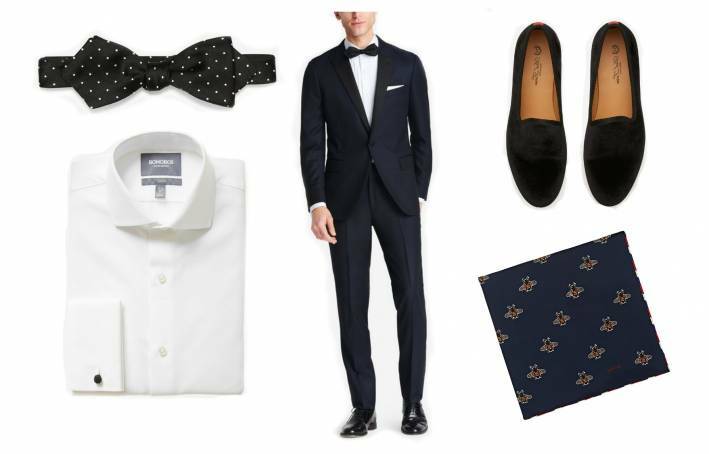 That perfectly draped shawl collar, that single-button defining your silhouette, a daring tuxedo stripe that draws the eye down to a perfect break above your dressiest shoes. Oh, and that gorgeous midnight blue hue that brings out your eyes. Sorry, let me just wipe the drool off my chin… What were we talking about? Oh right, wedding guest dress codes! For summer (and, ahem, fall and spring) weddings, a velvet slipper makes for a dapper alternative to classic black lace-up dress shoes. Those Del Toros are top-of-the-line, but if you shop around, you can definitely find more affordable options out there. And finally, a simple white pocket square is fine, of course, but why do that when you could really splash out with a silk Gucci pocket square covered in bees and edged with a red, white and blue border? We so rarely get to truly dress up these days, so why not do it really, really right. A tuxedo is the pinnacle of masculine elegance, and honestly, when was the last time you felt elegant anyway? When your next invite arrives in the mail, take a cue from my teal suit-wearing former crush. Your role as a wedding guest is the perfect moment to see an opportunity where others see just another night in that go-to suit. Don’t get me wrong—I love your go-to suit. You love your go-to suit. But testing the proverbial waters by changing it up with, say, a bright, bold printed shirt or (cough, cough) a gorgeous ivory blazer, could be the difference between a good look and a great one. Plus, the stylish impression you make may just be burned forever on the brain of a cute girl who once had a crush on you. Win-win!